Photo diary of an afternoon spent soaking in the golden sun exploring one of Australia's most breathtaking natural landscapes. This World Heritage-listed area is only 2 hours outside of Sydney and is accessible by train. 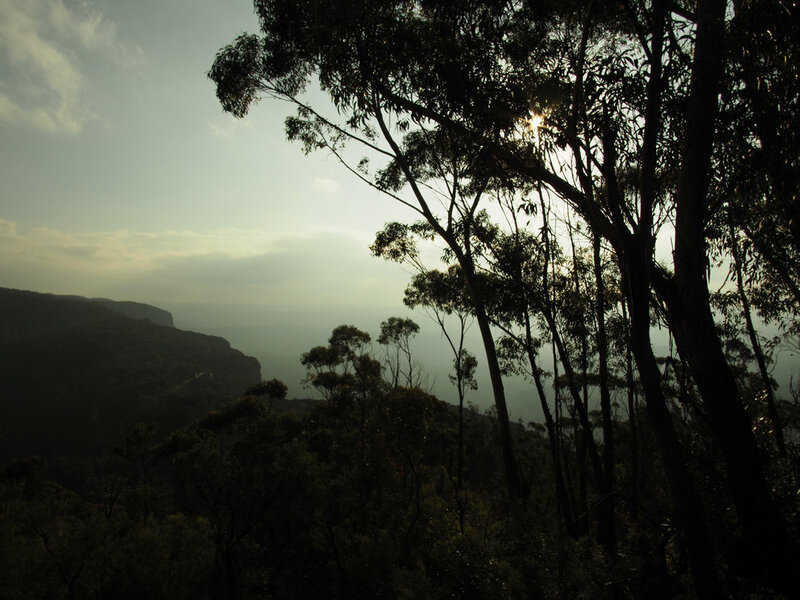 The vast expanse of wilderness paired with the charming historic town of Katoomba makes the Blue Mountains a must-see when staying in Sydney. In Katoomba we stopped in for lunch at this spot on the corner that caught our eye, The Yellow Deli. It is everything one could hope for in a cozy cafe situated in the mountains, I imagine this spot is magic on cold winter days. The rustic craftsmanship of the place makes you feel as though your stepping in for a feed in a wooden cabin or hobbit hole in Middle Earth. The ambiance is warm & inviting, the staff kind and attentive with so much love pouring out of every little detail in the space. Everywhere you look around the wooden booths, walls, and fireplace are flowers, murals, and beautiful lamps. The menu is heaven for those looking for something healthy & hearty. The food is fresh & wholesome with some excellent vegetarian & vegan options. Before we left we purchased some Yerba Mate & a delicious loaf of organic wholegrain sprouted bread. It wasn't until I began to revisit & write about the Yellow Deli that I discovered that their reputation online is somewhat tainted by the fear & judgement of their religious beliefs, some have even gone as far as to call them a cult. Although I cannot claim to have much personal experience with this community, categorizing them as a cult seems quite cruel, again I say this not having had a first hand experience with their lifestyle and practices. As an outsider just stopping for a a feed, they seem to be a group of people dedicated to living in a loving & functioning community that offer meals & a space that nourish peoples needs. I noticed the biblical scripture painted under one of the murals and although I'm not religious, I did not feel uncomfortable in the space, there was no evangelistic chatter from the staff and if I hadn't read up on the establishment I wouldn't have given it another thought. After exploring their website I found that the first Yellow Deli was born in the 70's in response to the Vietnam War & the "Peace, Love, and Happiness" movement, since then it has grown into a spiritual community of Twelve Tribes around the world that claim love is the centre of their lives & all their efforts. This mantra seems to be in line with what most people truly want in their lives, a place to belong. So if you can see past the prejudices we have developed in our society between "believers" and "non-believers" and come into the space simply as a individual looking for a place to rest & recharge, I believe you will leave very happy & full. yet it grows into the largest of garden pants and becomes a tree, so that the birds of the air come and nest in its branches. The sun set as our train began making its way back down from the mountains towards the city. It was a exceptionally beautiful day.